Desert View Indian Watchtower designed by Mary Colter and built by the Santa Fe Railroad at Grand Canyon National Park. Courtesy National Park Service. Source: NPS, Park Rank out of 378 National Park Units 2018. Individual - $15 for 7 days. Vehicle - $30 for 7 days. Motorcylce - $25 for 7 days. Yearly Grand Canyon Pass - $60 per vehicle/other entry. South Rim - 50 to 80 degrees with frequent thunderstorms. North Rim - Usually ten degrees cooler than at the South Rim with frequent thunderstorms. Canyon - Extreme temperatures, up to 105 degrees. Above: Fog hovers over the Grand Canyon in 1905. Photo courtesy Library of Congress. Right: Canyon view in the present day. Courtesy National Park Service. 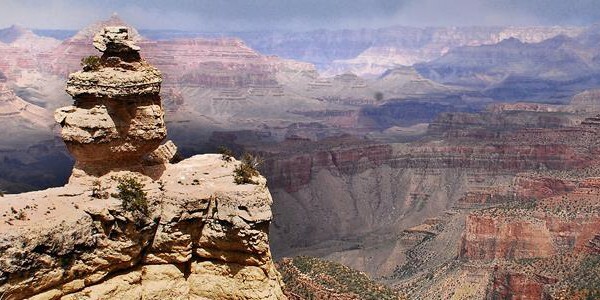 It is an awe-inspiring site, to witness the geological landscape that spans the width and depth of the Grand Canyon. Formed by the waters of the Colorado River through generations upon generations of cutting into the beautiful rock, this rich and stark landscape provides a grand glimpse of the history of the land that is the southwest section of the United States. The Grand Canyon is two hundred and seventy-seven miles long, fifteen miles wide at its widest, six thousand feet deep at its deepest, but all along the way, what you are witnessing is the hand of time in a rather slow, but steady course to create such a diverse geological masterpiece. Around every corner of the park, history abounds. The history of the people who have inhabited the region during a good many years of its erosion, an estimated four thousand years. Both the Anasazi and the Pueblos, the Cohonin, Paiutes, Cerbat, and Navajo, and the Hopi and the Hualapai, have called this area their own. Their ruins, both inside and outside the park, bare witness to the many changes in the landscape while reminding us of the slow pace of that change. 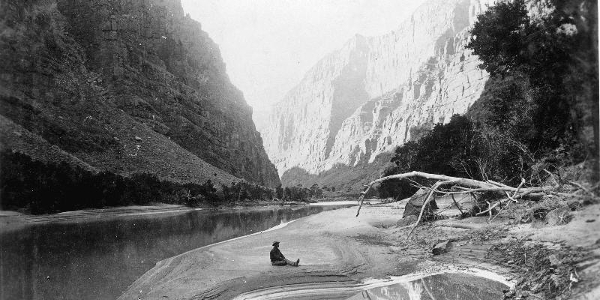 Although Spanish explorers and priests had seen the canyon over three hundred years prior to the U.S. Army, 1540 for the small group of Spanish soldiers led by de Cardenas on orders from Francisco Vasquez de Coronado, it was the Powell Expedition of 1869 by Army Major John Wesley Powell of the Colorado River on the urging of a previous expedition leader from the U.S. War Department led by Lt. Joseph Ives, and later the removal of the Indian population from the immediate area in 1882, that led to eventual pioneer settlements on the rim. The pioneers thought that mineral resources would be a profitable venture in the area, but tourism soon became the goal through stagecoach runs from nearby towns. In 1901, the Grand Canyon Railway began its run from Williams, Arizona on September 17 at a cost of $3.95 for the sixty-four mile journey. 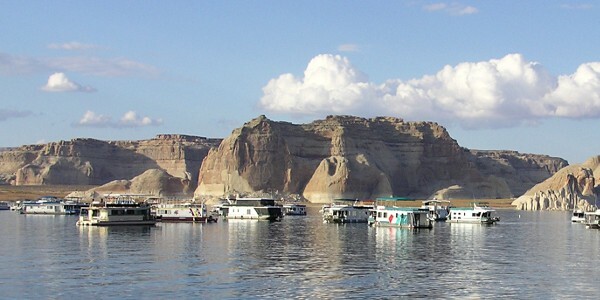 Below the canyon rim, the reason for its existence lies in the Colorado River. At Lee's Ferry, where the beginning of the Grand Canyon is officially marked, the canyon rim rises to five thousand feet above the floor. Therefore, at most locations, it is not possible to see the actual river from the rim due to its depth. There are certain viewsheds where this is possible. Ask at the nearest ranger station where the best places are. Grand Canyon National Park - In 1887, U.S. 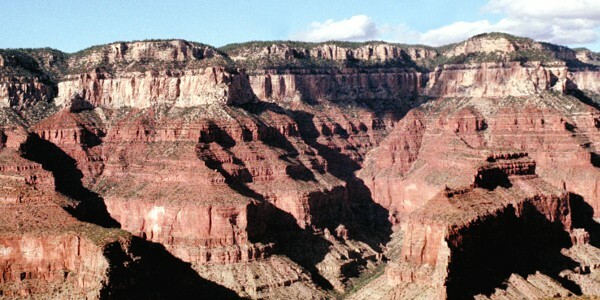 Senator Benjamin Harrison introduced legislation to establish the Grand Canyon as a national park, but he bill failed. When he became president, Harrison designated the land as a National Forest Preserve on February 20, 1893. This protected the park in some ways, but mining and logging were still permitted. After a visit by President Teddy Roosevelt in 1903, additional protection was added, which culminated in designation of the park as a United States National Monument on January 11, 1908. Mining was still allowed and thwarted the effort to establish it as a National Park until eleven years later. 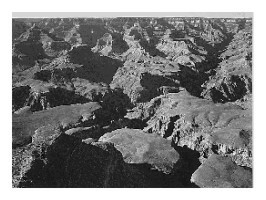 On February 26, 1919, President Woodrow Wilson signed the law making Grand Canyon National Park the 17th park in the nation. Various changes in the size of Grand Canyon National Park have taken place over the years, with the merging of additional lands in the federal system into one entity by President Ford, as well as the deletion of Havasu Canyon when it was given back to the Havasupai Indians. Photo above: Man on the canyon floor during the 2nd John W. Powell Expedition of 1871. Courtesy National Park Service. Below: Duck on a Rock viewpoint at Grand Canyon National Park. Courtesy National Park Service/Kristen M. Caldon. Protected since 1893 and made a full National Park in 1919, visitation has grown from 44,173 in 1919 to its current level of over five million tourists. And the reason for its growth has been well documented, and deserves special treatment for all who venture into the park. Slow down for awhile and take in its beauty, as well as its opportunities. Whether that means a horseback ride, a mule ride into the canyon (reservations most often required well in advance), backcountry camping, or listening along with groups to a ranger during a day or evening program at the North or South Rims which describe what the inner canyon is all about, a Grand Canyon vacation is a time to reflect on the awe-inspiring nature that surrounds you at every turn. There's even flights above the canyon in airplanes and helicopters to witness sights like Point Royal. There's almost endless vistas in this magnificent piece of geography that boggles the mind, whether you're viewing it from the ground or air. The Colorado River - Now restricted in its flow due to dam projects surrounding the park, the Colorado River has become a haven for the whitewater rafting community with nearly twenty-two thousand rafters taking in the Grand Canyon scenery by boat. Grand Canyon National Park T-Shirts and Souvenirs from the official merchandise of America's Best History. 1. Take the free shuttle bus tour (running in the summer season) that traverses Hermit Road. With no private vehicles allowed in the summer, it provides an uninterrupted view of the spectacular canyon near the South Rim. 2. Take the ranger guided walk at the Tusayan Ruins. They are offered daily. 3. 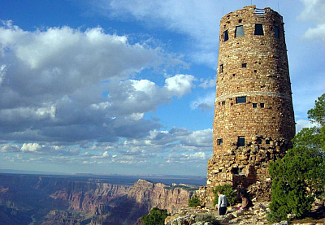 If you're staying at the North Rim, take the half-day drive to Point Imperial. This is highest point on the North Rim, at 8,803 feet and from here you can see the Painted Desert and Marble Canyon. 4. Pick up a copy of the park newspaper, THE GUIDE, which lists the ranger programs for the day. Take advantage of their expertise and follow along with a program or two. 5. For those who want a more modern interpretation of events, take in the Powell Expedition IMAX movie outside the park at the Tusayan National Geographic Visitor Center. 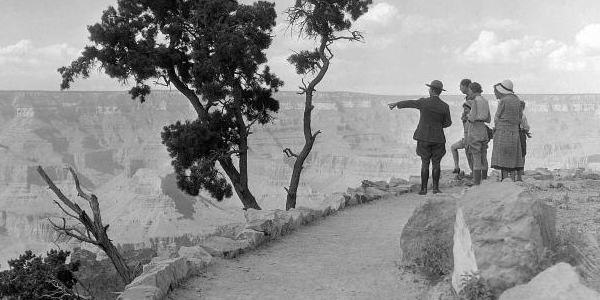 Photo above: Ranger guided walk at the Grand Canyon in 1932. Courtesy National Park Service. 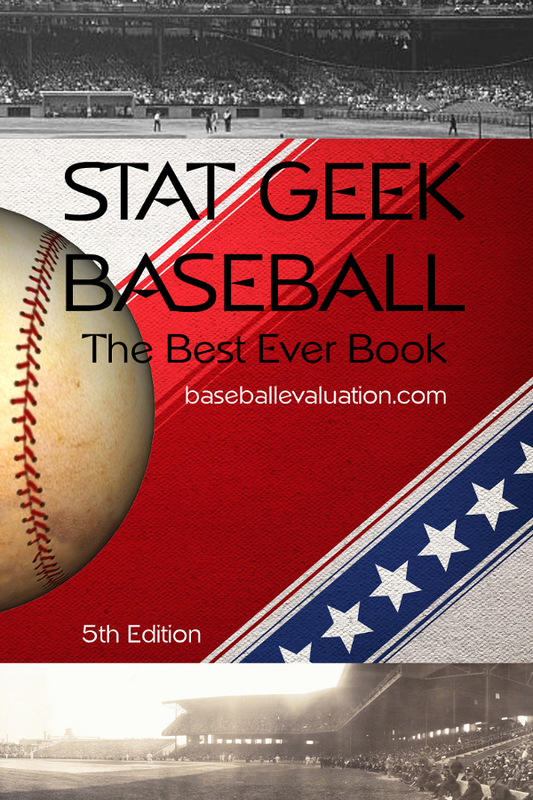 Check out our partners at Stat Geek Baseball where the history of baseball resides with stats you can get nowhere else. Canyon View Information Plaza, South Rim - The South Rim area is open every day, twenty-four hours per day. The information plaza is open 8 a.m. to 5 p.m. with some extended hours. 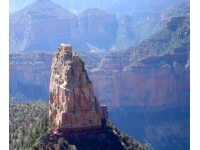 North Rim Visitor Center - The North Rim area is open from mid-May to mid-October. When weather cooperates, it is open during the day in the off-season. The Visitor Center is open mid-May to mid-October and includes seasonal interpretive programs. Desert View Information Center, East Entrance - South Rim side of the canyon. Open year round, if staffing levels permit. Kolb Studio - Grand Canyon Village, South Rim, Art Exhbits on the Grand Canyon. Tusayan Ruin and Museum - 22 miles west of Grand Canyon Village. Pueblo Indian history in the Grand Canyon, circa 800 years ago. Also guided tours of the adjacent ruins. Yavapai Observation Station - 5 miles north of the South entrance. Includes fossil exhibits of the Grand Canyon. This is a temporary exhibit. The lodges and campgrounds of Grand Canyon National Park are varied. The South Rim and North Rim (seasonal) lodges range in price from $55 to $291 per night. South Rim Lodges - Bright Angel Lodge, El Tovar Hotel, Kachina Lodge, Maswik Lodge, Thunderbird Lodge, Yavapai Lodge. North Rim Lodges - Grand Canyon Lodge. Backcountry - Inner canyon requires a Backcountry permit, and additional per night fee. Reservations suggested. Desert View Campground - 25 miles east of Grand Canyon Village (South Rim). No reservations or hookups. Open mid-M ay to mid-October. Mather Campground - Located at the South Rim with tent or RV sites. 25 miles east of Grand Canyon Village (South Rim). Reservations recommended during peak season. No hookups. Open year round. Trailer Village - Located at the South Rim. Includes hookups. Operated by Xanterra through Grand Canyon Lodges. North Rim Campground - Located at the North Rim and available mid-May to mid-October. Reservations required. Tent and RV sites. No hookups. Other Lodging and Campgrounds - Beyond the borders of Grand Canyon National Park, near both the South and North Rim locations, the Forest Service operates three campgrounds. Another commercial campground is availabe approximately seven miles outside the South Rim entrance. Lodging is availabe outside both entrances as well. 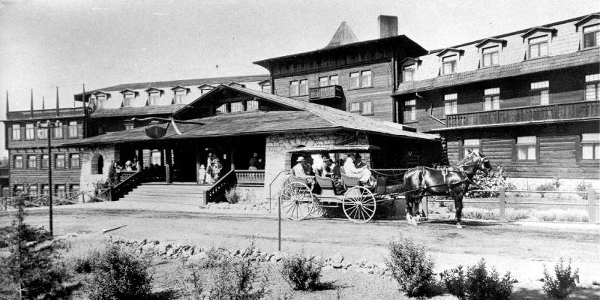 Photo above: El Tovar Hotel at the Grand Canyon, circa 1905. Courtesy National Park Service. Below: The Grand Canyon Railway Depot, circa 1905. Source: Library of Congress Photographs and Prints. Check out the Ultimate Beginner's Guide to Hiking.